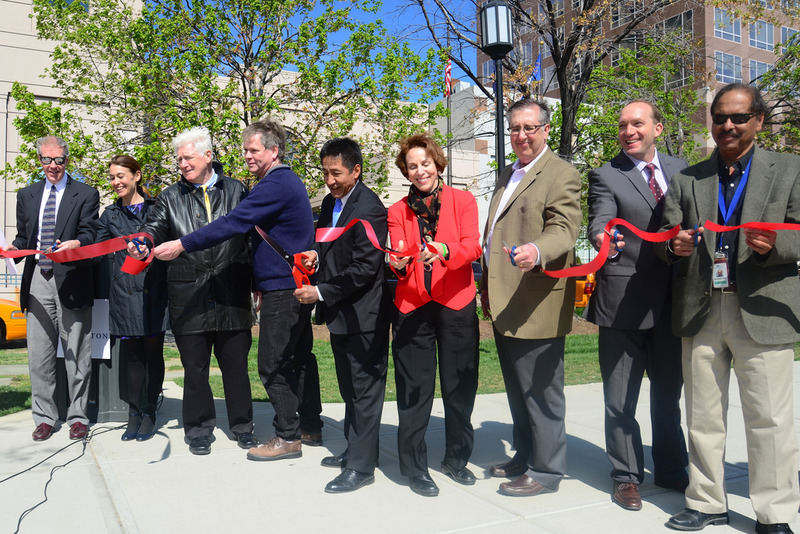 A new multimodal project aimed at bringing bicycle and pedestrian friendliness to a Pentagon City neighborhood was unveiled today with a ribbon cutting by Congressman Jim Moran and representatives from Arlington’s Department of Environmental Services (DES). Held in front of the popular Fashion Centre at Pentagon City Mall on on South Hayes Street, the metro station served as a fitting backdrop for the ceremony since the connectivity it provides is largely responsible for the area’s success. The Pentagon City metro stop, on the yellow/blue lines in Arlington County, is the second busiest Virginia metro stop after Rosslyn. At peak tourist periods during the summer, according to DES Transportation Director Dennis Leach, the station surpasses Rosslyn in ridership. The Multimodal Project, not quite complete, brings a series of improvements to a five-block portion of South Hayes Street meant to enhance “safety and access for pedestrians, bicyclists, transit users, and vehicles” in the area, according to a county website. Congressman Moran described the street pre-renovation as “unsightly, unsafe, and … not very Arlington-like.” DES’s improvements should go a long way towards improving the highly trafficked stretch of road. Arlington’s Public Art Administrator Angela Adams described to Mobility Lab after the ceremony how public art was incorporated into all areas of the design, providing details as obvious as the contemporary and energy-saving LED lighting, down to the detail of the striations in the median curbs. Simon Property Group Inc., owner of Fashion Centre, recently announced a 50,000 square foot expansion of the property, including a new mall entrance and two new levels of retail shops and restaurants with outdoor seating. The renovation highlights the impact transit-oriented development and public infrastructure has on the private sector, and bodes well for the streetcar, which will run from Pentagon City along Columbia Pike and is also projected to result in substantial investments by the private sector. Splash photo courtesy U.S. Air Force. Story photo by M.V. Jantzen on Flickr.